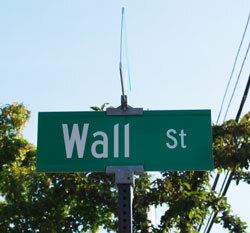 A Wall Street sign at the intersection of Canal. Amid a slew of multimillion-dollar projects that Tim Slottow presented to the University of Michigan regents on Thursday, one was notable for not moving forward – a controversial parking structure and office building previously proposed for Wall Street. Slottow, UM’s chief financial officer, told regents at their monthly meeting that the university’s purchase of the former Pfizer property – a deal that closed on Tuesday – resulted in enough additional parking spaces to meet their current demands for the medical campus. Regents had given initial approval for the $48.6 million parking project at their September 2008 meeting, despite vocal protests from residents in the Wall Street neighborhood. It would have been a structure with 500 parking spaces and offices for UM’s Business Engagement Center, which now leases space at 1214 S. University Ave. Slottow characterized the project as being on a “pause” indefinitely. It was one of two parking projects in the works that have been halted, at least temporarily. Another roughly $50 million parking structure was being planned in the north campus area, Slottow said, primarily to serve demand at the Walgreen Drama Center and adjacent Stamps Auditorium. During a break in Thursday’s meeting, Slottow told The Chronicle that they haven’t experienced the parking crunch they’d anticipated in that area. Given the lack of a real crunch, they felt it would be prudent to hold off on construction, he said, especially in the current economic climate. All of this could be welcome news for residents of the Wall Street area, who had organized to protest the parking project. At a meeting covered by The Chronicle in December 2008, residents expressed frustration that the university hadn’t sufficiently explored alternatives to dealing with its parking demands, and that UM officials weren’t listening to residents’ concerns about traffic congestion, impact on air quality, and crime. At another meeting in January 2009, city officials met with Wall Street area residents and talked about the city’s relationship with the university, both on that parking project and more broadly. At the time, city planners said the university was proceeding on parallel tracks with both the Wall Street parking structure and possible interest in a Fuller Street transit station. Some residents may have already heard this news about the parking structure put on pause. On Tuesday, we encountered Eugene Dariush Daneshvar – a board member of the Riverside Park Place condominiums on Wall Street. And Daneshvar had told The Chronicle that the board was having a meeting that night with Ward 1 city councilmember Sabra Briere, who would be giving them an update on the parking structure project. Updates for other parking projects will be on the agenda at next month’s regents meeting. Slottow said that Hank Baier, UM’s associate vice president for facilities and operations, would be making a presentation to regents at their July 16 meeting to give an update on the university’s strategic parking plan. Note: Additional details about Thursday’s board of regents meeting, which included approval of the FY2010 budget and a 5.6% tuition increase, will be covered in an upcoming article. I think that the Fuller Rd. Train/Bus hub is a great idea.And there is A.A.T.A bus route that services that location ( right up to the bldg).The current Greyhound station is a embarrassment for Ann Arbor.I wish that Indian Trails would start servicing Ann Arbor. ( Greyhound and the worst service)Kalamazoo, Mi has a beautiful Bus/Train/Local transit(Bus)/Taxi, all in the same location. They kept their Historic Train station and improved and expanded it.